Crew has been part of the Robinson tradition since 1990. Robinson Crew is a competitive varsity sport open to boys and girls in grades 9-12. Unlike other sports, Robinson Crew receives no school funding, and must rely on fundraising to field a competitive team. If you want to give rowing a try before joining the team, or if you want to add to your skills, take advantage of fall rowing programs available in the area. To prepare for the spring season, every rower (unless participating in a winter sport) is strongly encouraged to participate in Winter Land Training, which takes place after school at Robinson from late November or early December through February. On-the-water training usually begins during the last week of February, subject to weather conditions. On-the-water practices are held at Sandy Run Regional Park, Monday through Friday in the afternoon, and on Saturday mornings until the regatta season begins, which is usually in the last week of March. Practices at Sandy Run may include training on land or on the water. Coaches drive a launch (motorboat) alongside boats to provide instruction. Regattas are scheduled on Saturdays. The type of boat (or "shell") Robinson uses is called an "8 boat", because it carries 8 rowers. These boats use sweep rowing, in which each rower uses one oar. (In scull rowing, each rower uses two oars.) 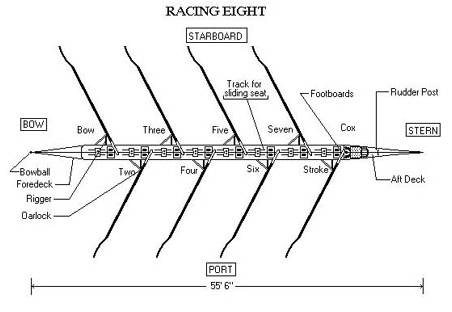 An 8 boat is illustrated below. In addition to rowers, every boat has a coxswain (a.k.a. "cox"). The coxswain is the person who steers the shell, coaches the rowers about technique, pacing, and power, executes race strategy, and provides leadership and encouragement. Coxswains are often selected from the lighter athletes to reduce weight on the boat. Men and women compete separately. The most competitive boat is designated the "1st 8" (Mens or Womens), the next boat is designated the "2nd 8", and so on. Coaches decide who rows on every boat, and make changes throughout the season. Some regattas may include categories for novice boats (in which all rowers must be first-year rowers), freshman boats (in which all rowers must be freshman), junior boats (in which all rowers must be junior year or younger), or lightweight or mid-weight boats (in which all rowers are restricted by weight). Regattas can be held using different formats. In some formats, the top finishers in the heats advance to the grand final, while the next few boats go to the petite (French for small) final. Sometimes, a regatta may use a repechage (French: repÃªchage, lit. re-fishing), meaning "to rescue" or "to save", is a practice used in competitions that allows participants a second chance to continue to the grand and petite finals.